Once a year an unusual event occurs in Marin real estate. It's the annual Sausalito Floating Homes Tour, and it's this Saturday September 25, 2010, from 11:00 a.m. until 4:00 p.m. Featuring 19 floating homes out of approximately 425 in the area, it's a self-guided tour. Although, there will also be a few docents on hand to answer questions and provide a little history. If you are planning to be in the area, I will be holding a free open house at Pat Kuleto's floating home, called Lilypad, from 1:00 p.m. to 4:00 p.m. This custom, 3 bedroom / 2 bath home is in a great location with stunning views of Mt. Tamalpais, Angel Island, San Francisco Bay and the Sausalito harbor. It features koa wood wainscoting and cabinets, custom metal work, fixtures and other Kuleto touches. 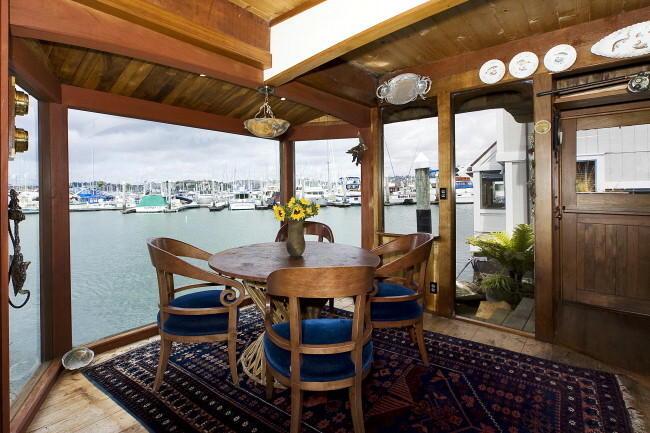 This one-of-a-kind floating home is listed at $495,000. Directions: 101, Bridgeway, L Harbor Dr., R Road 3.